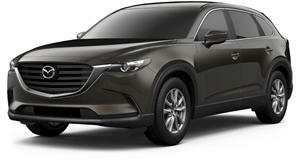 Is The New CX-9 The First Step To Mazda Becoming A Luxury Brand? Without question crossovers are the hottest segment in the auto industry today. This trend isn’t likely to end anytime soon and, therefore, automakers are launching crossover after crossover, of various sizes and price tags. But which ones are the stand outs? We recently had and came away impressed. Not only is it powered by a solid turbocharged 2.5-liter four-banger with 250 hp and 310 lb-ft of torque, but Mazda has upgraded literally everything in comparison to the outgoing model. You still get three rows of seating (yes, that third row is actually usable), but the overall luxury factor has been turned up by a factor of 10. If it weren’t for the Mazda badges we’d believe we were sitting in a BMW or even an Audi. Seriously. But is Mazda sacrificing its "Zoom-Zoom" reputation for luxury? Not at all. Heck, why not combine both, and that’s what the new CX-9 has done. If this is representative of the future of Mazda then we’re all for it. But there's one thing: price. Now, the base 2016 CX-9 starts off at $32,420, which is quite reasonable. But the top-end CX-9 Signature trim begins at $45,000. Will Mazda be able to convince crossover buyers to hand over $45k? That's what remains to be seen. Terrific handling, on-par pricing and some stellar engines can’t quite make up for the Mazda CX-9’s disappointing practicality. But do people who buy a family hauler really care about how it drives?